Edmonton Paving | Residential, Industrial & Commercial > Blog > Concrete Services > Why does Concrete Crack? Concrete as a raw material is known for its strength, durability, and endurance. Even though constructing a road with concrete is costly, it is beneficial in the long run as it does not require repeated repairs or maintenance jobs. Concrete is also beneficial as it can withstand extreme weather conditions. Even though concrete is exceptionally durable, and strong, it can suffer damages eventually and so you need to protect your concrete driveway. The damage can be in the form of cracks which can lead to potholes. 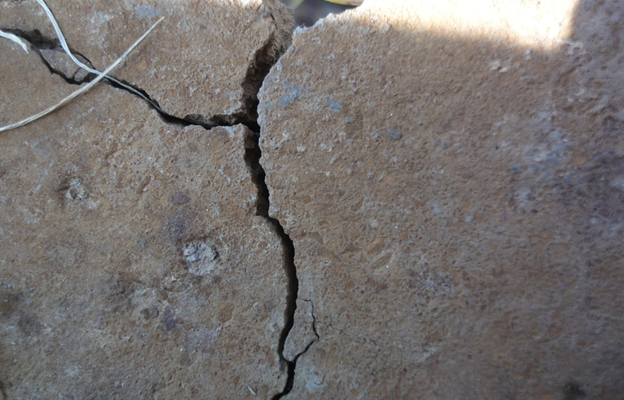 But why do concrete crack? To answer your question, in this article we have mentioned the reasons why concrete surfaces develop cracks. At times when a concrete company manages to create an odd mixture, the road constructed can eventually develop cracks. If in case, the mixture that was prepared for constructing your driveway consisted of excessive water, or excess dry cement the constructed road would eventually result in shrinkage. This shrinkage eventually leads to cracks. There are certain instances when your driveway or a road is constructed next to a tree. When your driveway is located near a tree, its roots are bound to expand. This expansion results in pushing the road on the concrete. This movement results in the concrete getting cracked as it cannot bear the force exerted by the roots. You need to be careful when selecting the concrete material for your road construction. If the construction company uses poor quality concrete or low-quality materials, then the concrete roads won’t last long. Also, you need to be careful that the construction company is experienced and has the right heavy equipment to create a smooth concrete surface that lasts long. Concrete is known to be tough and long-lasting. But extreme weather conditions can cause damage to concrete surfaces. Frequent rains can cause water logging and so the accumulated water can seep into the road and subsequently cause cracks. Also, if the concrete road or driveway is built in an area where the temperatures are extremely high, the concrete mixture can become loose and cracks begin to appear. If your driveway, road, or pavement has cracked, you should get in touch with a concrete company to prevent further damage. Proper construction, timely maintenance, and repairs can help you increase the life of your concrete surface.